TYRONE MANAGER MICKEY Harte has named his starting side to face Dublin in Sunday’s All-Ireland senior football final at Croke Park (throw-in 3.30pm, live on RTÉ / Sky Sport). The selection shows one change to the team that started against Monaghan in their 1-13 to 0-15 semi-final win. Mark Bradley has got the nod to start at corner forward, while Lee Brennan has been held in reserve. In the 49th minute of their last four clash, Bradley replaced Brennan. It comes as the one personnel change as the Red Hand prepare to face Jim Gavin’s kingpins. Elsewhere, Kieran McGeary is named to start in the half-forward line while Padraig Hampsey lines out at corner back. Email “One change as Tyrone name team to face Dublin in All-Ireland final showdown”. 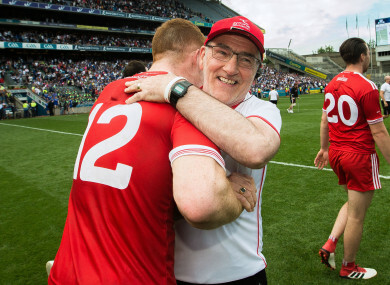 Feedback on “One change as Tyrone name team to face Dublin in All-Ireland final showdown”.